Netanyahu succumbs to pressure from International Criminal Court, won't demolish Khan Al Ahmar. Prime Minister Netanyahu ordered the scheduled demolition of the illegal Khan Al Ahmar outpost postponed following pressure from the International Criminal Court at The Hague. Israel is delaying the evacuation of Khan al Ahmar "at this point" officials close to the prime minister said. "We want to exhaust all the options." The Defense Ministry said that "the decision to postpone the evacuation was made despite the Defense Minister's resolute opposition." Netanyahu's decision to postpone Khan Al Ahmar's evacuation is in direct opposition to a Supreme Court ruling mandating that the town be evacuated by October 1. While the deadline has already passed, police and the IDF have been preparing to destroy the outpost imminently. Last week, International Criminal Court Chief Prosecutor Fatou Bensouda said that Israel can be prosecuted for war crimes if it goes ahead with the demolition. "Extensive destruction of property without military necessity and population transfers in an occupied territory constitute war crimes," she said. Bensouda warned that "I will not hesitate to take any appropriate action within the framework of my authority according to the Rome Statute" enabling the ICC to prosecute world leaders. Though the outpost's demolition was approved by Israeli courts, the Supreme Court in July froze plans to evacuate Khan al-Ahmar, pending an appeal by residents. 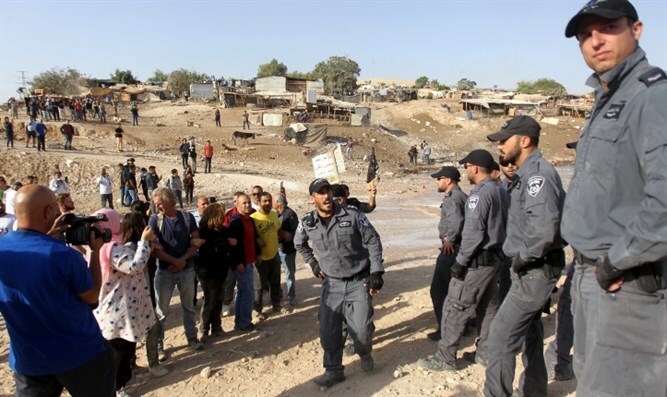 In September, however, the Supreme Court ruled against the residents, rejecting their claims and clearing the way for Khan al-Ahmar’s evacuation and demolition.